"Making" experts share the basics of building spaces for collaboration, innovation and hands-on learning. Makerspaces, where students, faculty and staff from diverse fields can come together to create, learn and work, are popping up on college and university campuses across the country. Here's how to build a "maker" facility to support multi-disciplinary collaboration, hands-on learning and experimentation at your institution. 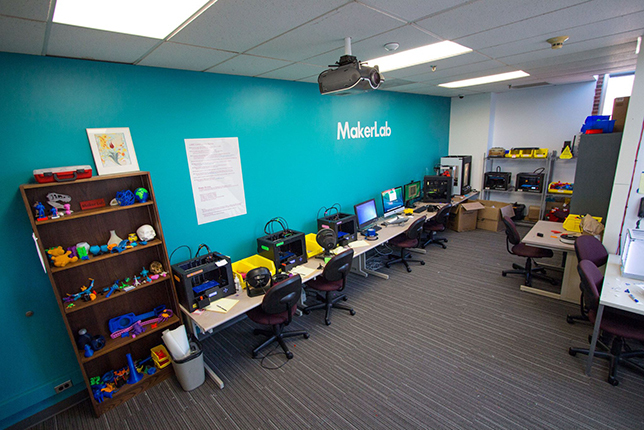 Also known as "fab labs," makerspaces typically provide an array of digital fabrication tools, electronics equipment and virtual reality technology in a communal area, where engineers, artists, researchers and other campus community members can freely tinker, design and prototype their ideas. Kat Steele, an assistant professor of mechanical engineering at the University of Washington, describes them as places where people can "quickly turn ideas into physical reality." In a recent study, Herman Miller analyzed maker, hacker and co-working spaces across the United States, concluding that in order to thrive in the current economic environment, "people need opportunities to tinker (make), deconstruct (hack), and network (co-work)." The researchers noted that makerspaces enable academic institutions to help prepare students for success by designing learning spaces that support those activities. The New Media Consortium also sees makerspaces as a tool for students to explore and develop new ideas, whether as part of their coursework or independent projects. The 2015 Horizon Report notes that makerspaces for education have the benefit of "engaging learners in creative, higher order problem-solving through hands-on design, construction, and iteration" — skills with "real, applicable value in a rapidly advancing world." "I think it's a way for students to express their creativity and apply what they're learning in class to quickly get ideas out into the real world, especially for engineering because we're focused on the equations and the theoretical foundations," said Steele. "Having an outlet where you can work with teams, find people with different backgrounds and use this space to turn ideas into reality is really powerful for the students, as both an educational space to complement their courses and a space where they can really dive deep and figure out what their passions are and what they want to create for the world." Ideally, a campus makerspace should be centrally located in a site that's approachable to everyone, according to the Herman Miller study. Ian Roy, head of the Brandeis MakerLab at Brandeis University (MA), agrees, adding that the space should also be publicly viewable. "I think a glass box in the center of your campus where you can walk tours through is really ideal," he said. "You want this to be public facing. You almost want people to see the work and be drawn to it. You don't want to hide it in a corner." He also said it's important not to underestimate the amount of space required, and the Brandeis MakerLab has already "far outgrown" its space. But he acknowledges that space at a university is a commodity that can be hard to come by. Technology at the Brandeis MakerLab is open-access and self-service. Steele noted that while central location is fantastic, the ideal location isn't always available, as was the case with the University of Washington's CoMotion MakerSpace, situated on the far side of campus. "For these spaces, you often take whatever large, open space on campus you can get, and then hopefully they work together to make the best out of it," she said. Jordan Tynes, a research and instructional technologist at Wellesley College (MA) and the primary support person for the maker technology at Wellesley's library, thinks the best location depends on the culture of the institution. "It's one thing to just drop it into a space and expect something interesting to happen, but it's so much more meaningful to think about how this technology fits in with the existing culture," he said. At Wellesley, there is a centrally located makerspace in the library and satellite makerspaces in some departments — as well as portable makerspaces called "Maker Toy Boxes." "We've gone to the campus center, we've gone to the science center, and we've done it here in the library, where we set up for one afternoon in each of these locations. Just one afternoon where we'll have some of this technology out and accessible for people to come and engage with," said Tynes. Another consideration when selecting a space is accessibility for individuals with disabilities. The University of Washington has taken the extra step of ensuring the layout and design of its makerspace are accessible to everybody. Steele is a co-principal investigator on a National Science Foundation-funded AccessEngineering initiative, which aims to increase the participation of people with disabilities in engineering. When the university was setting up its CoMotion MakerSpace, Steele and a team of researchers worked with the CoMotion team to figure out how makerspaces could be used as a model of inclusivity. By bringing in students with various disabilities, they were able to suggest improvements, many of which were quite simple to implement. The team documented what they learned in "Making a Makerspace? Guidelines for Accessibility and Universal Design," which is available as a free, downloadable PDF. 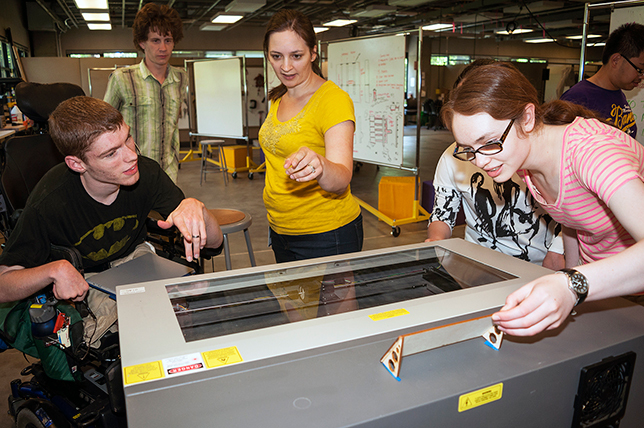 Accessibility was a design priority for the University of Washington's CoMotion MakerSpace. The design changes included making sure the main tools, such as the 3D printers, the electronics workbench and the laser cutters, were in fixed locations in the lab, so individuals with visual impairments could memorize their locations. Some of the workbenches can also be raised and lowered for people of varying heights, including those in wheelchairs. And for people with hearing impairments or on the autism spectrum, there are quiet rooms on the periphery of the makerspace, so they can talk or work without being disturbed by the noise of the lab. "I like to encourage people to bring diverse groups into the space because often they'll notice little things in the space that you can suggest a change to," said Steele. "Getting diverse stakeholders or perspectives early on can help to make sure that the space is usable by the widest swath of campus as possible." If there's one technology that virtually all makerspaces seem to have in common, it's 3D printers. The devices, which make it possible for people to transform their ideas from digital renderings to physical objects, have become much more affordable in recent years. That affordability, combined with the devices' utility and flexibility, have made them very popular and many makerspaces have several on hand. Brandeis University, which doesn't have an engineering program, has traditionally shied away from that type of technology "because the tools were obscure and difficult to learn, but in the last five to 10 years the barrier to entry has gotten so low, these tools have become democratized and accessible from a price standpoint but also from a workflow standpoint," according to Roy. "It's not confusing for a non-engineer, for an artist or a social sciences or a digital humanities person, or even a researcher who is not steeped in that particular technology, to go from zero to expert in a very short period of time." Roy identified four categories of technology commonly found in makerspaces. The first is digital fabrication tools, which includes 3D printers, as well as CNC machines, laser cutters and the computer-aided design (CAD) software to draw the objects. The second category includes "things to bring the digital world into the real world and things to bring the real world into the digital world, and just iterate back and forth," said Roy. That includes 3D scanners to complement the 3D printers, as well as Xbox Kinects and stereoscopic infrared cameras that can do gesture- or touch-input tracking. A third category is electronics, including microcontrollers such as Arduino, system-on-a-chip (SoC) computers such as Raspberry Pi, soldering kits to connect components and workstations that are static- and heat-safe. The fourth category is virtual and augmented reality tools, such as Oculus Rift, Microsoft HoloLens and Google Cardboard, as well as the software tools, such as Unity and Unreal Engine, to develop for those environments. Unity and Unreal Engine are video game development tools, but people can also use them to create interactive immersive virtual environments for devices such as Oculus Rift or Google Cardboard. Although much of this technology has become more accessible to non-engineers in recent years, people still need some training about how to use it, and many educational institutions take the approach of allowing anybody to learn and use the tools. "We try to keep it as open-access as possible and also as self-service as possible," said Tynes. "There doesn't necessarily have to be a staff member holding the user's hand." While the staff do provide hardware and software orientations, primarily to ensure safety, they don't have any specific training requirements. Even with training, accidents will happen and equipment will get broken. Roy sees these accidents as learning opportunities. "We don't put our tools in an ivory tower and protect the resource particularly," said Roy. "We want you to break it and we want you to learn how to fix it." Roy thinks it's important to keep makerspaces accessible and democratized. "Our goal here isn't just to inspire the local people but it's to create a platform where anybody can iterate and do these fabrication cycles that are faster paced and get to a product that they thought was unachievable or out of their range."